Navy Freedom of Entry Parade & Street Party Celebration! Shoalhaven City Council is proudly supporting the Navy in an upcoming Freedom of Entry community event, to be held in the Nowra CBD on Friday evening, 23 November 2018. The community is invited and encouraged to attend this historical event. Support and cheer for Navy personnel during the parade and join with them afterwards in a street party celebration, to be held in the Nowra CBD. Further information is provided below, including the Event Program and Road Closure Notification. Download the Event Map and Program. Did you know you can view the Freedom of Entry photos and download your favourite hi-resolution images via Council's Flickr album? Check it out now! The Shoalhaven community are invited to The Freedom of Entry event from 6.20pm on Friday, 23 November 2018. The event will include a naval parade involving personnel from HMAS Albatross and HMAS Creswell and community street party celebration. The parade, commencing from the Nowra Showgrounds at 6.20pm will proceed into the Nowra CBD, finishing in Junction Court, this will include a ceremony at which the Navy will exercise the right of Freedom of Entry to our City. Following the parade, the community are invited to attend a street party celebration in the Nowra CBD, located at the Junction Street and Kinghorne Street intersection. The street party celebration will include live music from the Navy band with food and drink available for purchase from local businesses within the Nowra CBD. This will be followed by a Navy Ceremonial Sunset performance to close the event. This is a Community Event and is strictly alcohol-free. 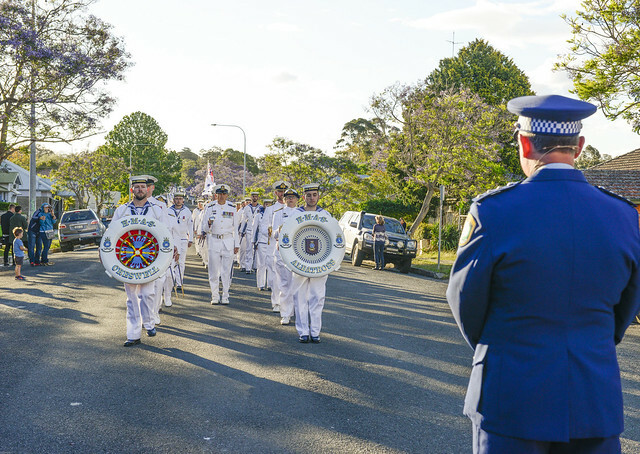 At Nowra Showgrounds, the community are invited to view up to 1000 Navy personnel form-up into marching lines for their Freedom of Entry Parade. HMAS Ship’s Albatross and Creswell personnel will march from the Nowra Showgrounds to the challenged point at Rauch Park where they will be challenged for proof of right and privilege to enter the city. The Officer in Charge of Nowra Police will stop the parade - requesting Navy provide proof of the right and privilege of entry to the city. Once acknowledged, the ships companies will exercise Freedom of Entry by passing through into Nowra’s CBD with swords drawn, drums beating, bands playing and colours flying. The community can view the Freedom of Entry Challenge at Rauch Park, located at 60 Junction Street in Nowra. A formation of Navy Helicopters will fly over the Navy parade. The community is invited to join with Navy personnel for a Street Party Celebration in the Nowra CBD! The intersection of Junction Street and Kinghorne Street in Nowra will be closed to traffic. Live music will be provided by the Navy Rock Band with food and drinks available for purchase in the Nowra CBD. Come along and join the party! At 8:00pm in the intersection of Junction Street and Kinghorne Streets in Nowra - watch the Navy Beat to Quarters and Ceremonial Sunset, which is derived from amongst the oldest of naval ceremonies dating back centuries to the age of sail. Originally, the ship’s drums were beaten as a call for the Ship’s Company to man their quarters, or action stations, when battle was imminent. Ceremonial Sunset reflects the worldwide naval tradition of saluting the lowering of the ensign at sunset each day in ships in harbour and shore establishments. A special volley (military volley gun salute) will take place at the end of the Ceremonial Sunset, to close the event (at approximately 8:35pm). Road closures will be in place for the Navy Freedom of Entry event on Friday, 23 November 2018 in the Nowra CBD. It is expected that up to 2,000 people may attend the event, and as a result, there will be controlled road closures and changed conditions surrounding the Nowra CBD. Junction Court, Nowra Between Kinghorne Street and O’Connell Lane will be closed from 7.00am – 10.00pm. Junction Street, Nowra – Junction Street between Berry Street and Kinghorne Street will be closed from approximately 4.00pm – 10.00pm to all traffic. Junction Street, Nowra – A rolling road closure along Junction Street, will commence from the Nowra Showgrounds at West Street to Berry Street and follow the Naval Parade with road closures occurring from approximately between 6.00pm – 7.00pm. Kinghorne Street, Nowra - Kinghorne Street between North Street and Worrigee Street will be closed from approximately 6.00pm – 10.00pm. Detours will be in place for the duration of the road closures. Every effort will be made to keep delays to a minimum. Resident direct access will be restricted during the rolling closures for a short period (approximately 15 minutes). In view of the special nature of this event, the cooperation of all traders within the affected areas would be greatly appreciated. Shoalhaven City Council requires Nowra CBD businesses impacted by the above road closures to ensure that their staff, customers and suppliers who are working or collecting/dropping off goods on this day, make alternative parking arrangements outside of the above listed streets from 2.00pm onwards on Friday, 23 November 2018. Notification letters have been sent to residents and businesses likely to be impacted by the road closures. Street signage is also in place to notify road users. Residents close to the Nowra CBD are advised that there may be loud and unusual noises heard during the Freedom of Entry event in the Nowra CBD this Friday night, 23 November 2018. Between 6.00pm and 9.00pm, there will be a noise and activity produced from live music played by the Navy band, Navy aircraft flying overhead and a Navy military volley gun salute (from 8.00pm). Please look after your outside pet animals accordingly. Is this an alcohol-free event? What is a “Beat to Quarters”? Will road closures be in place for the event?